A video message from Scindie Saint Fleur to sponsors of students at Grace Emmanuel School. Good afternoon! My name is Scindie. I work as the psychologist for the mission. I work at the Lighthouse and at Grace Emmanuel School. Today I’m making this little video so I can talk with the sponsors. Grace Emmanuel School is one of the best things we could have in the community of Source Matelas for children and for parents, especially, with food, education, medical care, transportation—free for all the children. That gives any child, even if they don’t have any means, access to education, one thing that is a priority for a nation. But I don’t want you to only consider the financial aspect of the opportunity you are giving a child. It’s more than that. Every time you decide to help a child, for that child, what does she see? She sees a person choosing to invest in her future. She sees a person who believes in her. She sees a special person with whom she can have a future. She can have a better tomorrow. Therefore, I tell you, don’t hesitate to create connections with the child. They consider you more than the money you give. They consider you maybe just like the parent they don’t have in their life. They consider you a person who believes in them, a person who believes they can become something great in the future. Therefore, don’t think of it as just a financial connection. Search to create connections with the children in writing. Talk with them, search to know what they want to do in their future, how their life is going. Make every effort to create more bonds. Every time you try to create a link, the children realize that even if they don’t have a parent in their life, they have you. 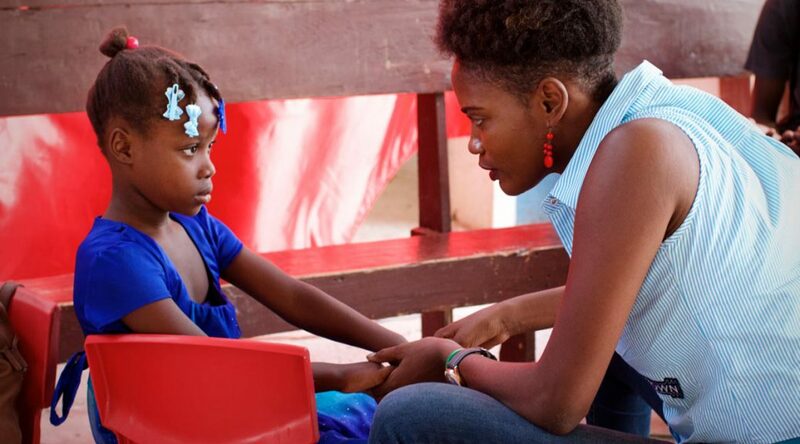 There could be someone in Haiti they could find, but with the situation of poverty that remains, people simply don’t focus on a child’s emotional problems. They don’t consider it an important part of development. They always think if a child has food, that’s sufficient for her. She can handle the rest. But for you, when you write, and talk to her, you show her you believe in her, that you have hope in her. She feels important in your eyes. Don’t be surprised when I tell you, during the childhood years, through all of adolescence, you could be the only person—the only adult—who has faith in her life, to remind her she can become something in her future because you chose to believe in her. So, with all my heart, I thank you and tell you search to make more connections with your child, because that will help them a lot, too.